I found this recipe on Single Serve Espresso site. 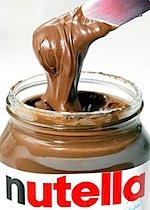 Mixing Nutella and Espresso, 2 things I love! 1-3 shots of espresso (depends on how strong you want it). Just stir the espresso with Nutella, make sure most of it dissolves in the espresso. Add hot milk. Stir and enjoy! You Get What You Pay For When it comes to coffee makers, quality counts. If you buy the cheapest coffee maker on the market, chances are you’ll end up with an equally “discounted” flavor in your cup. To assure yourself of great tasting coffee day after day, check out the Bunn, Cuisinart, Mr. Coffee, Krups, and Senseo brands. Alternatively, check out a French press. For that personal cup of coffee, you can never go wrong with a French press! You can read the whole list at HowToAdvice.com. Also check The Coffee Guide site for more coffee tips! This post introduces the Coffee section, more topics coming soon!